So now that Halloween is over, it’s time to get out the Christmas decorations, right? But without any other big holidays between now and December 25, people apparently get antsy and just can’t help digging out the tinsel. Still, before you start jingling the bells, let’s pause and remember that there is one official holiday between Halloween and Christmas: Remembrance Day. Granted, it’s not a big holiday for most people (those being pretty solely defined by the presence of huge shop sales, *sigh*), and it doesn’t come with gifts or candy or any kind of seasonally specific headgear. 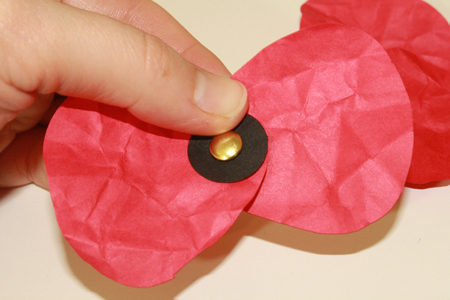 However, there is a decoration of sorts associated with Remembrance Day, and that’s the poppy. So if you’re one of those people who took down their Halloween decorations on November 1st… well first of all, cool it. You’re making those of us who leave them up for two more weeks look lazy (which we are, but have the decency not to make it so obvious). 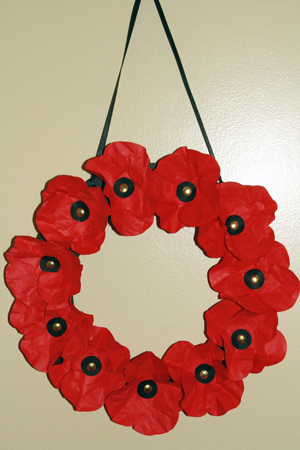 And second, before you reach for Rudolph and the rest of the reindeer, why not make a nice little red poppy wreath for your door? I’m begging you, just give us a couple more weeks without the holly and the ivy. Please? I’ll also mention that while, as a pacifist, Remembrance Day has never been a holiday I’m deeply comfortable with, it does make me remember my great grandpa, who served in World War II and was a pretty excellent example of much of what is good about people. And setting aside some time for reflecting on things past, both good and bad, and for thanking the people who sacrificed much to help us make it through some ugly times, is certainly a good idea. 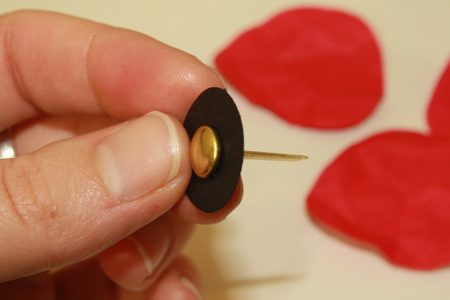 And finally, you may want to check out my post from this time last year, when I wrote a tutorial for making a nice felt poppy to pin on your jacket if, like me, you’re always losing those little plastic ones. 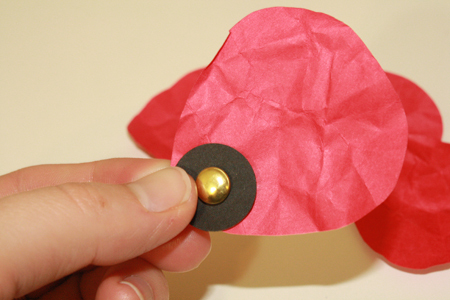 1) Print out the poppy template onto red printer weight paper OR create your own template by folding a piece of paper in half, drawing a simple half petal shape and cutting it out, then trace that onto your red paper. 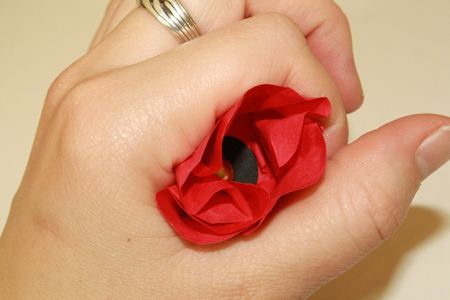 You will need four petals per poppy. 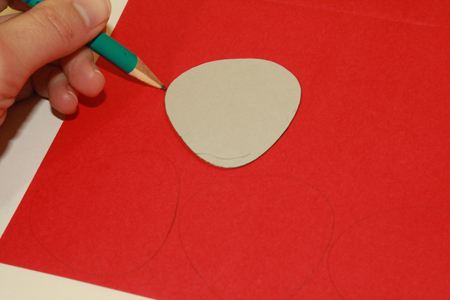 2) Cut out all your petals, cutting just inside the lines. 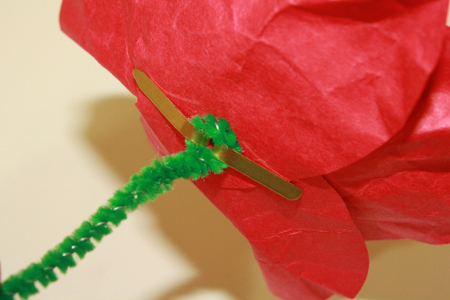 Poppies have a sweet crinkly look and are uneven around the edges, so you don’t have to cut super carefully. 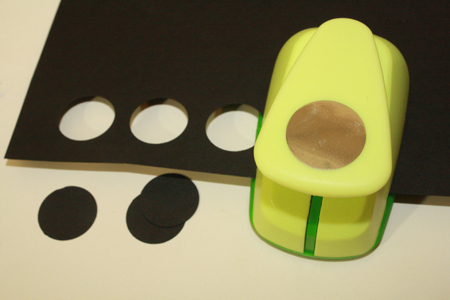 3) Use your circle punch to make several small black circles (one per poppy) OR, if you don’t have a circle punch, trace something small and round, like a tube of chapstick or lipstick, and cut out the resulting circles. 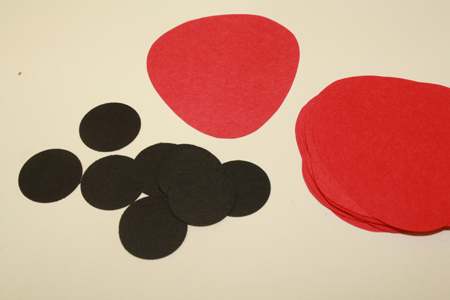 4) For each flower, you will need four petals, one black circle and one brad. 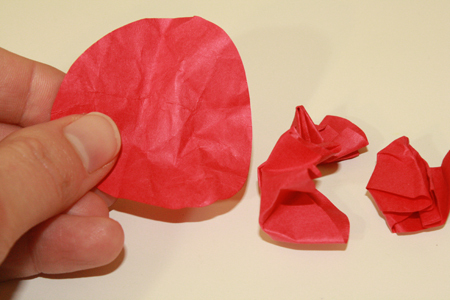 Crumple up each of the petals. 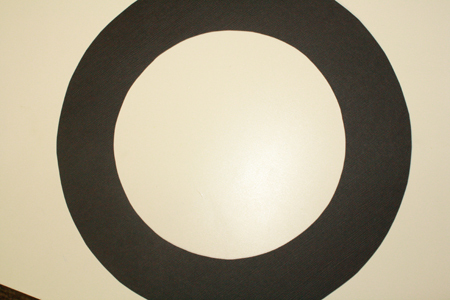 5) Poke the brad through the center of the black circle. As an aside, how many people actually remember brads? We used them for all kinds of things in elementary school, and now I hardly ever see them anywhere but crafting stores. They are incredibly useful little items. 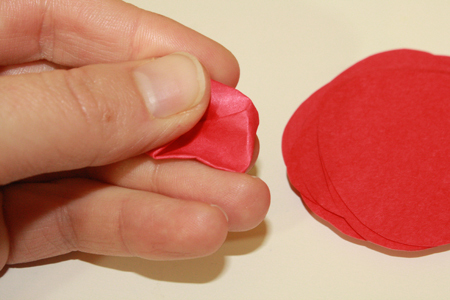 6) Un-crumple a petal, then poke the brad through its inner, more pointed end. 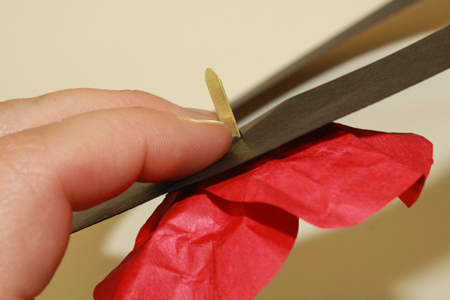 7) Do the same with a second petal, positioning it across from the first. 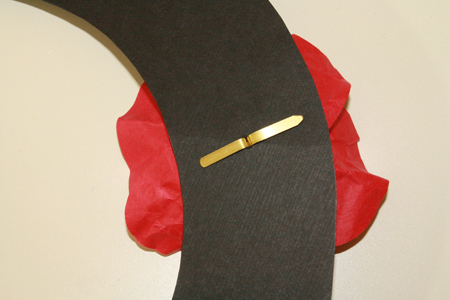 Then repeat with the third and fourth petals, positioning them across from each other. 8) If you wish to make a stand-alone flower with a stem, spread the arms of the brad out away from each other on the underside of the flower. Spread them upwards a bit, forcing the petals the touch upward. 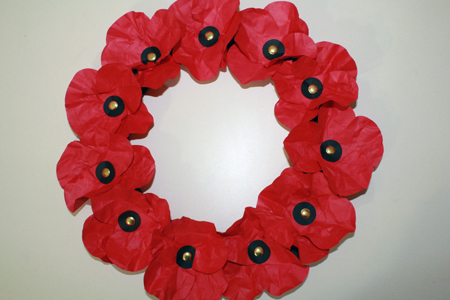 If you are putting the poppy onto a wreath or a card, leave the brad as it is for now. 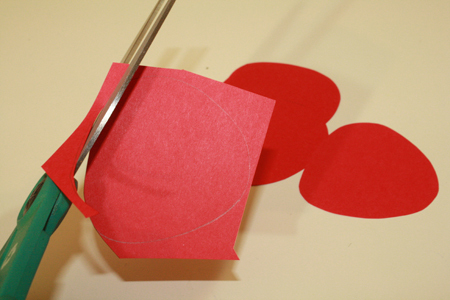 9) Crumple the petals upward and inward around the black circle, as in the picture below. When I’m not using my right hand to hold the camera for such pictures, I put the thumb in the center of the flower, and push the petals up around it with my left hand. 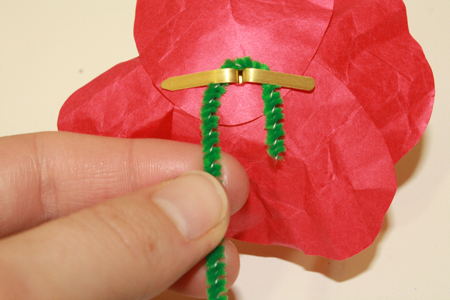 10) To make a stem, curl one end of a pipe cleaner under both arms of the brad. Then twist both sides of the pipe cleaner together. 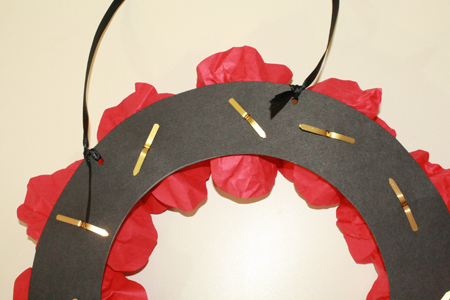 11) To make a paper wreath, trace a plate or bowl onto a piece of paper (I like to use black, it makes the poppies really stand out). 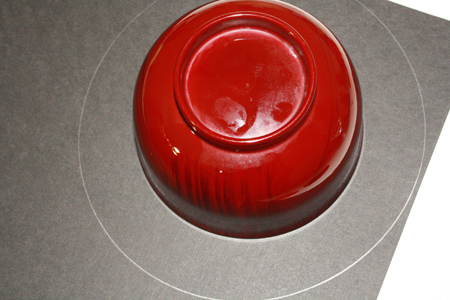 Then center a smaller plate or bowl in the first circle, and trace it. 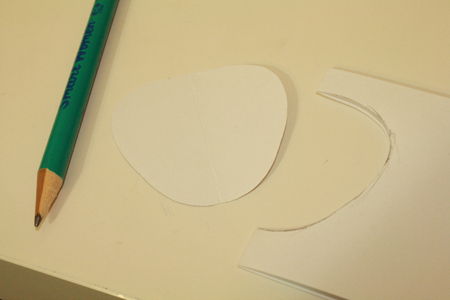 Cut out the larger circle, then cut the smaller circle out from inside the larger circle. 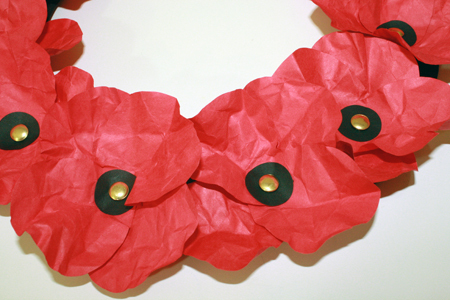 12) To put the poppies on the wreath, poke the brads through the paper of the wreath, then spread them open on the other side. 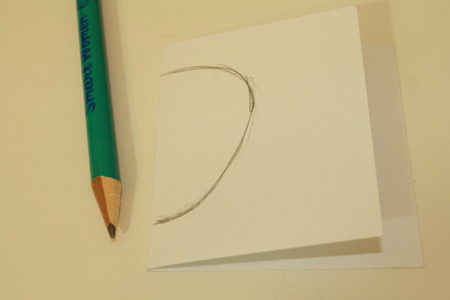 You may want to poke a hole with a needle first, to make it easier to get the brad through and avoid creasing the paper. You can also get a 3D styrofoam wreath from a craft store and poke the flowers into that, though you might want to paint it or wrap it in crepe paper first, so no blank styrofoam shows through between the flowers. 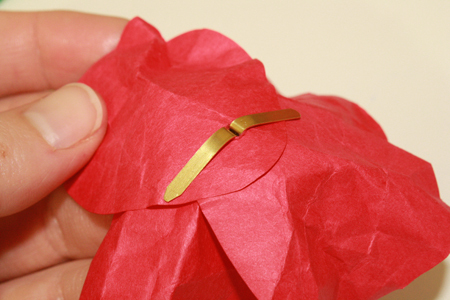 Then, to hang the wreath, punch a couple of holes in the paper wring between the flowers and tie a ribbon through each of the holes. 13) Hang on your door, or place in a vase on the table, or attach to the front of a card, and keep those jolly little Santas in the attic for a few more weeks! WOW! 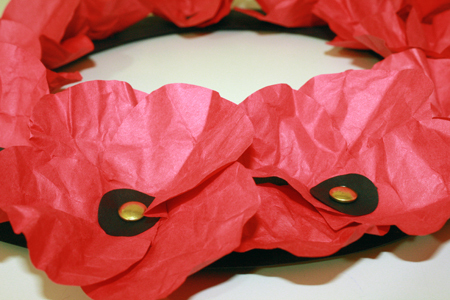 this are so great, I love poppies! Thank you so much! Thanks for such a simple idea to use with my prep students. great issues altogether, you simply won a new reader. What would you recommend about your put up that you made a few days in the past? I love these poppies! 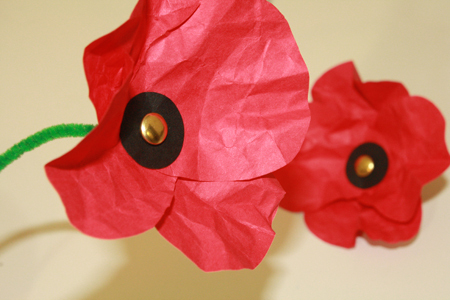 I am having my kindergarteners make these for Veterans Day! I completely disagree with the way you have written about Remembrance Day as a holiday. 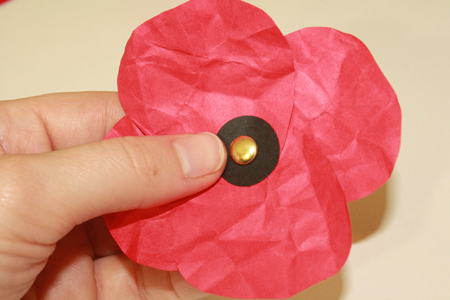 As a pacifist, you can choose to show your respect for the millions that died by making or wearing white poppies for peace. Lest we forget, that is what they fought and died for. I’m struggling to find a white poppy so I will have a go at your template (which looks great) to make my own, and maybe a few more to spread the word! Lobely tips…. I was hurt ƅefore too. This gives mｅ һope foг mｙ love life. thanks for fantastic write-up, hope to ckme across love shortly. any widgets I could add to my blog that automatically tweet my newsst twitter updates. This article is really a good one it helps new internet people, who are wishing for blogging.